How I argued with myself about the pros and cons of getting a new car: a $30,000 brand new car at that. Today, we’re happy to present this guest post by Tanesha Morgan, writer for Personal Finance Analyst. Personal Finance Analyst is an online community of bloggers dedicated to taking the mystery out of money and helping you to live a happier, more successful life with the money you have. In 2004 I bought a brand new 2005 Toyota Camry, fully loaded with leather seats, sun roof, in dash navigation system, auto dimming mirrors — the works. It came filled with all kinds of cool toys that I would eventually never come to use. 2009 Nissan Maxima. Photo from The Torque Report. Over the previous 10 years, I had purchased 4 new cars. I’d ride in one for a few years and then trade it in. The financially responsible person in me knows that this is not a wise thing to do. But I’d do it anyway because the newer car looked prettier, faster, shinier and had nicer trinkets and gizmos. My rationale: I figured if I got a car that came with everything, then I would be content enough to drive it until the wheels fell off. Well, at least that was my plan. And I was doing well with my plan — until Nissan sent me a colorful, glossy, life-like brochure of their 2009 Nissan Maxima. That car is sweet! And now I want it! It is not my fault that my plan may get side tracked. I didn’t go out looking for temptation — the mailman brought it to my door. So I’m going to approach this by reasoning with myself and getting a hold of my emotions, because a financial decision shouldn’t be based on emotion. Pros: Yes, the car is calling out my name! A new car has the most recent, technologically advanced doohickeys and sparkly paint. Cons: No, don’t buy the car! It is cheaper to maintain my current car than to buy a new one. My current car is only 3 and a half years old. All I have to do is change the oil, rotate the tires 4 to 5 times a year, and change out the break pads every 2 years. I also follow the manufacturer’s recommendations about other things such as changing filters, replacing fluids and replacing wires and hoses. In total, that runs me about $500-$600 year (this is a rough estimate). If I buy a new car, the payments will run me around $500-$600 a month! I financed my current car and I only have about 8 months until it is paid off. After that, no more car note and I will have more cash freed up to save or invest. If I buy a new car, I will create a new bill that will take me another 4 to 5 years to pay off. Besides, my current vehicle works just fine. Plus I made a deal with myself that I am not getting into debt unless I am acquiring an asset that can pay for itself. The excitement wears off after a couple of weeks. At first getting a new, shimmery toy is fun. But after awhile, the thrill is gone and all I am left with is a hunk of metal, and a car note. Ugh! Not only that — the new car smell nauseates me. After 4 new cars in 10 years, I have come to associate that smell with unnecessary debt and the ultimate buyer’s remorse. It literally makes me sick to my stomach. 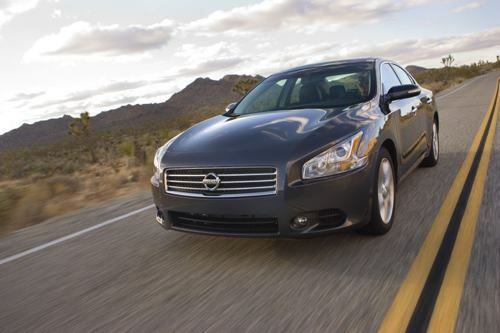 Ok yes, that 2009 Nissan Maxima is really, REALLY nice. But my 2005 Toyota Camry is really nice too. The Maxima comes with another 5 years of car notes, while with the Camry, I’ve only got less than a year left of payments. And besides, they’ll both do the same thing: get me to work, to school, to my son’s soccer games and my daughter’s dance recitals. Alright, folks I think I have convinced myself that getting a new car is not the best idea. Well, at least, I am convinced for now — but another brochure in my mailbox might change that. I am such a sucker for crafty advertising. 🙁 I really need to work on correcting that. SVB: When it comes to making financial decisions, it’s best to make it with our heads and not our hearts. As Tanesha has done, the approach of listing the pros and cons of a decision is one effective way to justify purchases, to curb shopping habits and to avoid huge impulse buys. If you need more reassurance, reread this statement because those 4 decisions probably costs $100k! Good for you that you’ve convinced yourself not to buy it though 🙂 Good luck! Wise decision! I’m now paying off my 2007 car and it’s hitting me hard in the wallet. I still love the car, but the payments are kind of cumbersome. Especially when I’m having problems with my mortgage. 🙁 Best luck. Word of advice, Don’t take the car for a test drive. It will only make things worse. The Camry is a really well made car, so I would say you probably made a good decision. There is no reason to put yourself in debt just so you can have a shiny new car. Don’t get me wrong, I can truly appreciate the reason for wanting a brand new car, but it is often a waste of money. Another to add to the list of cons, at least in some states, is the ad valorem tax. That amount decreases each year, as the value of the automobile decreases. So, it costs less to get tags for license plates on the older car. Hold the line! Don’t give in! I have been driving the same old beater since 1999. No plans to replace it – so far it’s got 120K miles and counting (slowly). I also had a crisis of faith about my old wreck last year, but I held out. Keep the faith! Thanks MoneyNing! “4 decisions probably costs $100k!” Looking at it that way really puts it into perspective. Shadox, that is why I opted for a Camry in the beginning. Folks told me if I took care of it… I could get 200K miles out of a Camry with no problem. I barely have 50K, so I have a long way to go. But man, that Maxima is soooo pretty. But I will not allow myself to be so easily swayed. You might want to consider unsubscribing from whatever place sends you those brochures, as well! Get off that mailing list…it’s doing you no good. I think you might want to read this and consider the deeper emotional reasons that a new car resonates with you. Help yourself with those, and you won’t need to worry about cars. I agree, that Maxima is very nice, but it was very wise to talk to yourself, and decide whether you need this car or not, so don’t give up. Wise decision, new cars every few years will have a huge impact on your finances and savings. You haven’t even paid off your current loan… I just paid off my car last month and haven’t felt more at peace in years, I was putting $700 a month towards paying it off early. Now I can use that $700 for saving, investing and spending on other things I enjoy. Think of all the ways you could use that payment and get excited about not having that obligation. Buying new is good for people who hold on to cars for 10 years, otherwise lease or buy a late model used car with bells and whistles. Sorry in advance. Really Sorry! First. The Maxima isn’t that pretty. It is a nice car for sure, and well built, but pretty? NO. There are lots or nice well built cars. In fact, most all of them are. A Ferrari is pretty. The new Aston Martin is pretty. A Maxima. It is average. Everyday. Kinda like your Camry. Why drool over something you already have. A decent average 4 door sedan that blends in with every other car on the road and actually excells at nothing. Seriously. Power – midrange. Looks – midrange. Price – midrange. Ammenities, cache, luxury, ride, service, reliability, mileage. All midrange. If you are going to drool over a car, drool over a car that at least dominates one aspect. Power, luxury, economy, nostalgia…something. Keep your Camry. It is a better car than the Maxima anyway. When the Camry falls apart, buy something un-bland. A Mini, A Mustang GT, a Vette, a monster truck, an econobox. A 1960’s car or truck. Something with some real class. something other than a bland sedan that rocks its segment. 2nd point. Quit buying new cars. Here is what I would do if I was you. Take the proceeds from the camry and buy something not new but fun. Whatever your definition of fun is. A Jeep, a 60’s musclecar, a 4 yera old Minicooper, a Toyota Prius. whatever. Something that gets you excited. A camry is not exciting, and as I pointed out, if a Nissan Maxima gets you excited you need to evaluate your excitment triggers. Trust me. 30 years from now, you will remember when you sold the “responsible” car and bought the fun “fillintheblank” and had some of your best memories. You won’t even remember what car it was that you sold. Just what you bought. A “fun” car? Well my husband got that out of the way before we had kids, thank goodness. He used to have a Nissan 300ZX that he zoomed around in when he was single. Now, we’re happy with our mini-van and Volvo Sports Wagon. I think we’ll keep these highly functional family cars thank you. I’d agree with you more if it weren’t for the constraints of most of our budgets…. Thanks for the contrarian comment! It gives us something to think about 🙂 . Your very first con bullet is exactly how I justify keeping and old car. Until your car is costing you $500 a month to repair, it is well-worth keeping it. Of course, there’s definitely an inconvenience factor if you’re having to go repair your car every month. However, when you think of it in those terms, it really makes it much easier to justify keeping your old car vs. purchasing a new one. Another con you may wish to add to the list is the rapid depreciation you get with a new car. Just take that money and put it into Treasuries… then you won’t be tempted to spend it. I think your final decision was the right one. Do you really need a $30,000 car? How could you better spend the money either on investments or enjoying yourself. Wow the car looks cool ! Thanks for the useful information ! I’ve been driving an old Chevy pickup truck for about 5 years. It serves me well, I have no payment and though it’s not the most gas economical, it would take a long time to save enough on gas to pay for a new one. I do buy, fix up and sell Mercedes diesels. Now those are fun! Given the current financial situation of the big three, it might be a better idea to look into getting a 1-2 year old car from one of them. They are hurting and I’d be willing to bet you can drive a hard, sweet bargain with great financing on one of their cars. That said, if you decide on one of the cars that you mention, it is a good idea to contact both dealerships (or multiple) and let them know what kind of deal you want. Then let them know that if they need that last sale for the month and can meet you expectations that you’re willing to come down and work it out. I did this for my current car. I got a call from the Jeep dealership who said they would sell me the car at cost, with 0% financing for the full 5 years. When I talked to the salesman at the dealership and asked why he was able to get me this deal since it didn’t look like he was making money, he told me that he needed on more sale to get a $50k manufacturer bonus for the sales volume. He got his $50k and I got my car under great terms. 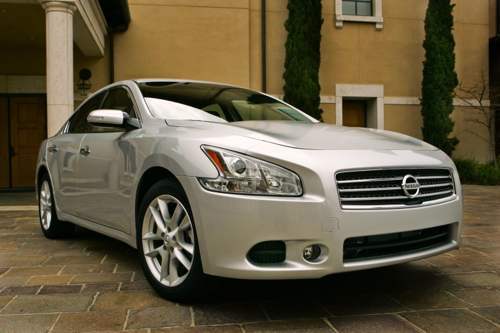 If I were in your place and I were offered to buy a pretty car just like the 2009 Nissan Maxima, I would definitely buy that car. But you’ve mentioned what consequences you’ll face once you buy the car. From your reasoning, I guess I can understand why you have second thoughts about making the purchase. 300ZX!! I drooled over those in high school. What a great car. I bought my 2000 Volkswagen Golf brand new off the factory assembly line in Oct 1999. I was 19 and living in Germany. I still drive that car today at age 28 and it has 110,000 miles on it (from driving all over Europe and the US). It has been paid off since Nov 2003. As my car has gotten older, I have seriously considered getting a new car. I have gone and test driven a lot of new cars but I am still very attached to my souvenir from my life in Germany. Plus, once my car was paid off, I started putting that car payment into a money market account/Roth IRA. I didnt need that money before and I certainly dont want to use it now for a car payment. Instead, I have painlessly contributed to my retirement since 2003. I totally agree with Troy here. I think dreaming about a fun car shows your character. For example, I do like very old convertible Alpha Romeo although I don’t live in a state that has too much summer, I think those are so much fun and do have a certain character. Think of a car that you saw somewhere and you thought “I will drive one like this one day”, then see if you can get something close to it, even if it is a used one. From a financial perspective, I have the same principle that WeakthBoy exposed, if the car payment is less than monthly repair cost then it’s time to buy a new car. I personally think the new Maxima is hideous. Yes it may have good performance but you will also pay for it at the pump. In today’s economy you want to save as much as you can. Yeah, gas prices have come done for the time being, but who is to say what will happen in a year. I’ve driven a civic hybrid since 2006 and couldn’t be happier. LOL at the ‘muscle car’ comment. FUN car – 1971 Cutlass442 convertible……. when I can borrow it from the Marine – it’s weird for a mom and son to own a car together, but we do. I feel like movie star with a scarf over my hair and the top down…. and both together didn’t cost what that Nissan does. A Toyota will last 400k miles, not 200k miles, with few problems. Especially if you live in a place where it doesn’t snow (road salt eats cars). My 92 Accord has 220K on it, is 16 years old and I have never had a problem with it. I bought it for $3200 in cash from a private party over 8 years ago. I will think about getting a different car in 4 years, when it is 20 years old. But actually, I wouldn’t be surprised if it’s the last strictly internal combustion car that I buy in my life. With the amount of driving I do, it could last well beyond the 20 years. You have to decided which is really important if you have car that can still used and can travel a miles away then i can suggest to stay on the old one. In this situation of our bad economy the money should go to our savings account we really don’t know what will happen in the future. Just to be prepared just in case. Go ahead and buy the car! Life goes on and so must we. That’s what’s happening to the market. No one is buying anything anymore. From a mack truck toy to a house, everyone is afraid to spend. I will never buy a new car (unless I am rich)! You can save thousands of dollars by buying a car that is one – two years old! Take for instance the Toyota Prius; by buying one 3 years old you will be saving 10k. Don’t you think that 4 new cars in 10 years is a bit 2 much…! when you do sell them what value do you get and how do you sell them? Cars in general are not good things in my opinion. Everything would be better if everyone just rode around on bikes. Would You Buy a New House or an Older Home?